I sometimes think the obsession with the comfy old, worn chair must be a Grandparent thing. You know the one. The single, padded lounge chair that has outlived its use by date, both in terms of fashion and style. Where it is so loved but looks like it belongs more in front of the TV in Joey and Chandler's apartments in the American sitcoms Friends or the resting spot for Marty Crane in Frasier. But for some reason, we love these warm, over-sized antiquities and long to keep them and relax in them. (Maybe we love them because they remind us of a visit to our Gramps' place). If you know the kind of chair that I'm talking about, then you will feel right at home at Gramps Cafe. The comfy chair is the go-to symbol for this newly refurbed corner cafe in Windsor Road Red Hill replacing the former Letter Lounge Cafe. 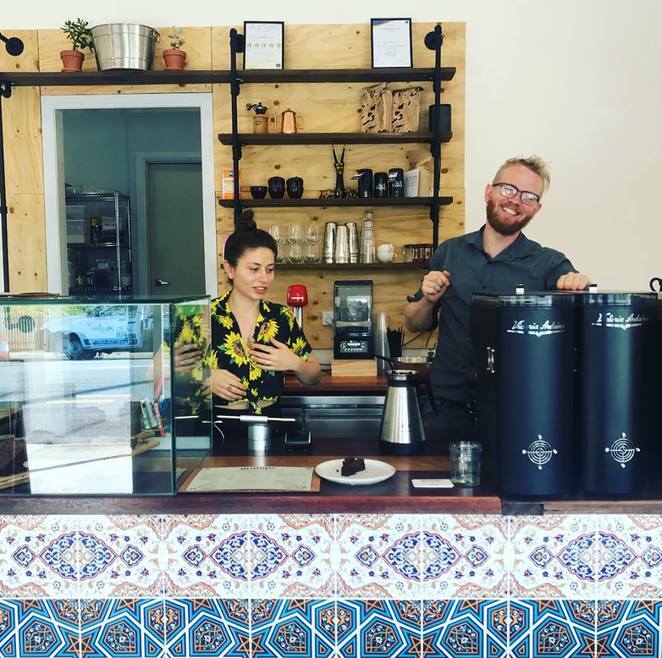 Gramps Café swung open its doors (complete with its impressive brass handles) in late July 2018. Anyone up for the challenge of Chess? Some hand-painted coffee artwork on the side of the wall at 110 Windsor Road leads the curved, concrete pathway towards Gramps. Pup and I wander up to the entry of the cafe and sit outside on one of the sleek timber bench seats off the curb and beside the 2 Grandad lounging chairs. I notice that a chess board sits on the coffee table in between the chairs - daring to be played. The counter is a few steps past the door and has a bright, mosaic, Turkish styled tile of Mediterranean blue, terracotta orange and white. Inside is anything but old with clean, simple white walls, timber floors, wooden tables and comfy cushions and lots of space. It will surely appeal to the hipsters. In their own words, Gramps "strives to gather quality ingredients, prepare on premise and design food that is inherently simple yet modestly complex." Their mantra is suburban brunch-time eats, Good Time Coffee. Gramps serve some classics alongside some very yummy homestyle sweets which are reasonably priced. I go on a Sunday morning and enjoy an aromatic, luscious chai which arrives with a unique, handmade brass spoon on the side of the saucer. Totally unique. Staff offer to bring pup some water, which he was pleased to receive. The cafe neighbours the "Speak Up" studio on the same site- a Brisbane based speech and drama studio with a focus on supporting kids in confidence, communication and creativity. Parents, friends and families dropping off the kids have an added incentive to do the drop off run. If you decide to visit Gramps, street parking surrounds the cafe and bus stop 11 is right outside the door. For meetings or finishing an assignment over a coffee, Wifi is available. So, if you long to remember the nostalgia of a visit to the Grandparents with a generous touch of the new, Gramps might be the place for you. love the arm chairs on the footpath. Very quirky. Unexpectedly modern food. My grandparents wouldn't have heard of most of those things. Would enjoy the,armchair though.